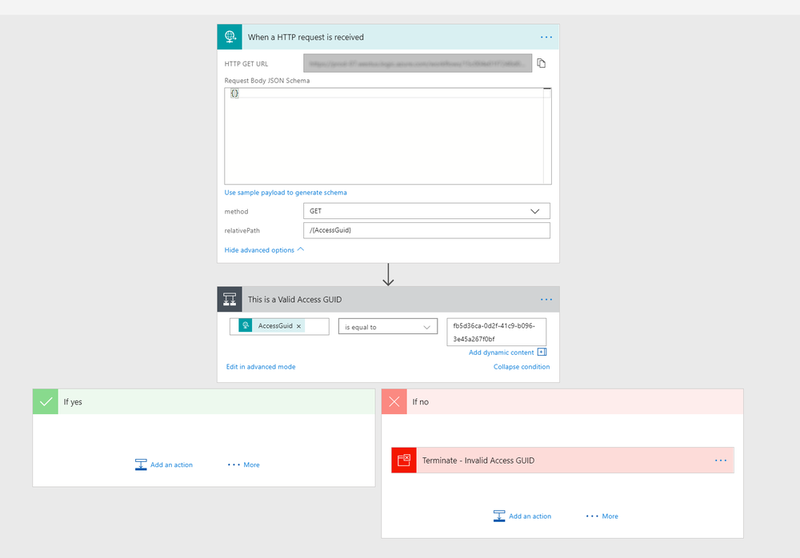 Our team has found the Microsoft Flow Trigger 'When a HTTP Request is Received' to be an extremely useful addition to our toolbox. Please, let us know about the cool stuff you've done with this trigger in Flow in the comments below. In some of the solutions we've created within SharePoint, this Trigger has unlocked new patterns in our CSOM / REST based solutions that weren't possible before. This awesome trigger is an Azure hosted endpoint that will kick-off an instance of your Flow. This is what makes this trigger so functional and beneficial to us in our solutions. This also means that this endpoint could potentially be called by anyone with its address. The endpoint created by this Trigger is very unique. I've bolded two of the URL parameters above that include long and varied strings of letters and numbers. The complexity of these make it more difficult for someone to find and use your endpoint. Below are a few considerations you'll want to take while using this trigger to initiate your Flow. Is corporate data at risk / exposed? Should this actually be a secure call? What would happen if someone from outside of our organization called this endpoint? This completely non-technical step is probably the most important one that you'll take. Here we will present a couple of simple options you can use with Flow to mitigate the risk of unwanted use of your service. This quick and easy addition to your Flow requires that callers provide a token when they call your Flow endpoint. Check that the caller is providing you with a secure guid / key before continuing your Flow. You can validate the requests received by your Flow from calling applications by requiring them to provide you with a key. You can use the Data Operations - Parse action to parse the Header information received by the When a HTTP Request is Received Action is called. Parse the Request's Header information to check the Request's origin information. In the example above, we use another combination of Conditions and the Control Terminate method to validate that the Request's Header information meets our requirements. Open one of the Flow runs and copy the JSON generated in the Headers property. In Edit Mode, add the Parse JSON task, and click the Use sample payload to generate schema link on this Action. If you aren't familiar with this Action, this blog post by Serge Luca contains an example of its usage. You can step up the options available to you for securing an endpoint if you were to use a Logic Apps Trigger rather than the Flow Trigger we've been discussing in this article - here is a post on this topic from the Logic Apps Team. Although not Flow, it does provide you with other options for automation with a secure HTTP endpoint. Hopefully you find this post helpful. We'd be interested in hearing about how you're using this endpoint or other methods you have used to validate the requests recevied by this trigger.